Pat writes about contemporary Australia: her novels, short stories and reflections give a fresh take on Australian life and society. 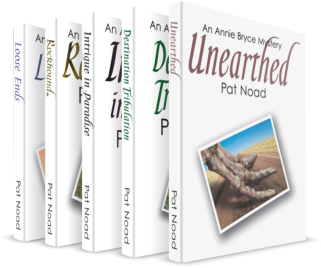 Her five Annie Bryce Mysteries are a series of stand-alone novels set around the vast and varied state of Queensland – light crime fiction with touches of humour, glimpses of time past and a powerful sense of place. Critics and readers alike have found her books ‘compelling,’ ‘engrossing’, ‘rivetting’ – and more. Her sixth novel On the Edge is a spin-off from the series, featuring some of the minor characters in earlier books with Annie taking a back seat. This is a departure from the crime genre: the book explores family bonds and fractures – and how far desperation can drive us all. Her award-winning short stories are included in two anthologies. Murky Waters is a collection of short crime fiction; Pick and Choose offers glimpses of our lives today, through stories, reflections and conversations. This website contains details of all eight books, and provides links to purchase them as e-books. 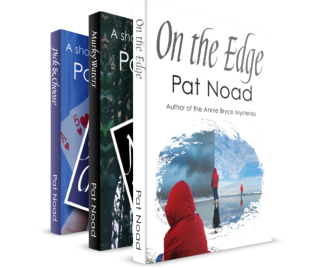 Print copies of the five books in the Annie Bryce series, and On the Edge, are now available from the author – see the Contacts page.